Clean spears and cut off tough ends. 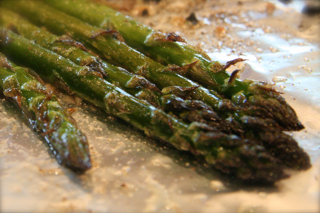 Line broiler pan with foil, melt butter (enough to coat asparagus) in saucepan; add some minced garlic to taste. Place spears in single layer on foil and pour butter over them. Place under broiler. Cook until tender and brownish. You need to keep turning them or they will burn. They will be on the crispier side. You can pick them up like a dill pickle to eat.